Generally you probably think of a “sport” as something you do to burn off all of the calories in the food you’ve eaten. But can eating be a sport in and of itself? 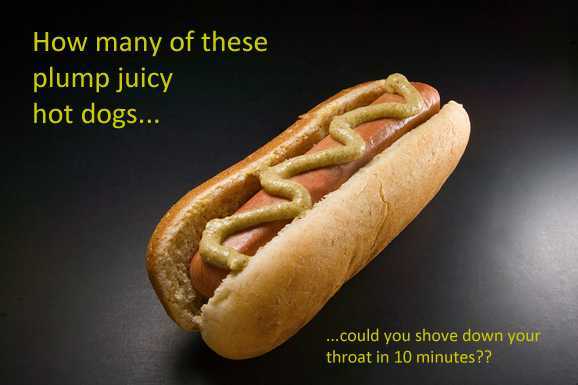 According to competitive eaters worldwide it can be! Think about the last big meal you ate — maybe a Thanksgiving or Christmas dinner when you stuffed yourself silly with more food in a meal than you might typically eat in a day. Think about how full you felt after that meal, when you weren’t even sure you could get dessert down, no matter how much you wanted that slice of pumpkin pie. Now picture yourself eating that meal ten times as fast. Imagine that one over-filled plate of food turning into a dozen, all eaten rapidly. Now how do you think you’d feel when someone offered you that pie? That’s a simple way to think about competitive eating — people compete to see who can eat the most food the fastest. I can’t say competitive eating sounds appealing to me, but it’s popular worldwide, so what do I know? There are even professional associations for the sport — the International Federation of Competitive Eating (IFOCE) and the Association of Independent Competitive Eaters (AICE)! 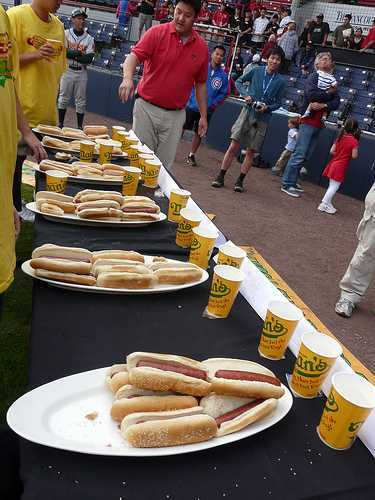 Competitive eating isn’t limited to the old fashioned notion of a pie eating contest or even hot dog eating contest (like the popular Nathan’s Hot Dog Eating Contest, held annually at Coney Island for more than 90 years). I have to say, I really did a double-take when I saw butter on the list. Yuck. Can you even imagine putting down 1.75 lbs of salted butter in five minutes like record holder, Don Lerman? I sure can’t! While most of the foods seem to be relatively “bad” foods to begin with, you can find some competitive eating events specialized in healthier options like the watermelon included above, peas, and asparagus (okay, so the asparagus doesn’t really count since it was deep-fried, but it sure sounds better than a pigs’ feet and knuckles eating contest if you ask me — and yes, there’s really a record holder in that!). How is Competitive Eating Considered a Sport? “It’s just eating. It’s not a sport!” you might be thinking. 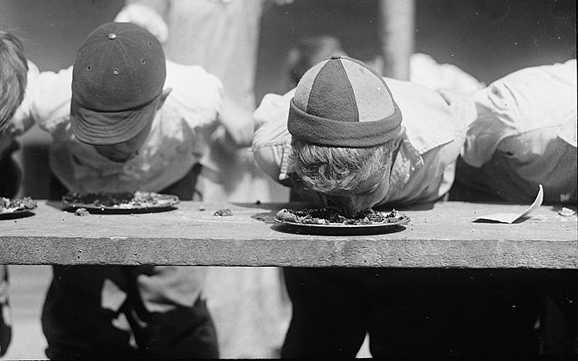 Then again, you might be surprised by the amount of preparation and training that can go into safely participating in eating contests. Just like an athlete might train for months before running a marathon, professional competitive eaters can spend months preparing for eating contests (and given that prizes can amount to thousands of dollars, it’s no wonder they train that long!). 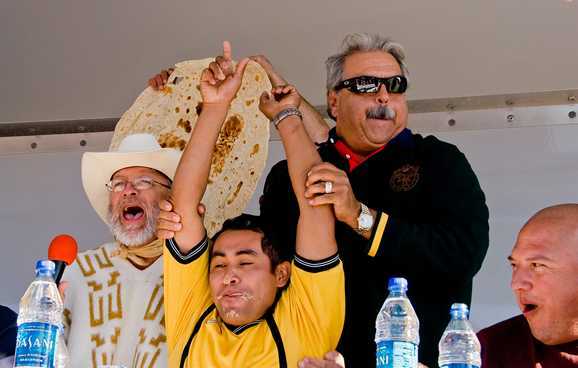 To win eating contests competitive eaters have to increase their stomach’s capacity. It naturally stretches as needed, but takes time to build the organ’s elasticity enough for it to expand to hold these amounts of foods in such short periods of time. 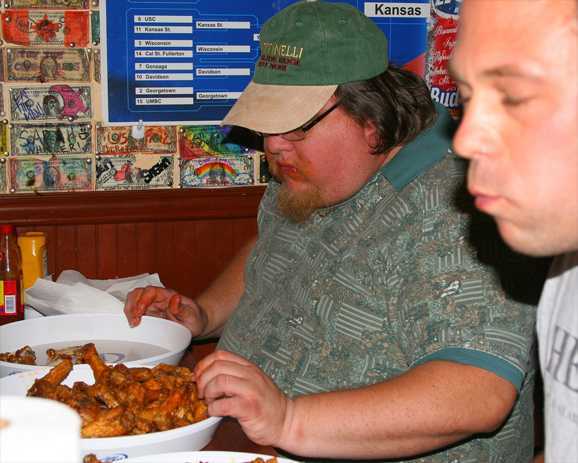 In order to get that needed elasticity, the competitive eaters “train” by consuming large amounts prior to the contest (for months in some cases). Sometimes they’ll do it by eating the contest food, allowing them to test their times and try to beat their own records to improve (probably not the healthiest option, if any of it can be considered truly “healthy” — healthy as in would someone ever say “eat competitively, it’s good for you!”). In other cases, they’ll fill up on bulky but low calorie vegetables, or drink large amounts of water (sometimes gallons) to get their stomachs ready for their next eating contest. Competitive eating isn’t only like other sports because there’s training involved. There are also rules and judges to make sure competitive eaters abide by them. For example, some IFOCE competitors use a technique called “dunking” (literally dunking their food in water or another liquid first) to make the food easier to put down (although I’m baffled by the fact the fluid weight wouldn’t fill you up faster!). The AICE, on the other hand, doesn’t allow it. If eaters leave too much food on the plate (excessive “crumbs” for example, so they actually ate less food) the judges might dock them points in their final count. And there are even rules about vomiting — yes, vomiting (as in what counts as vomiting, and what doesn’t in respect to judging those final counts). Yum. 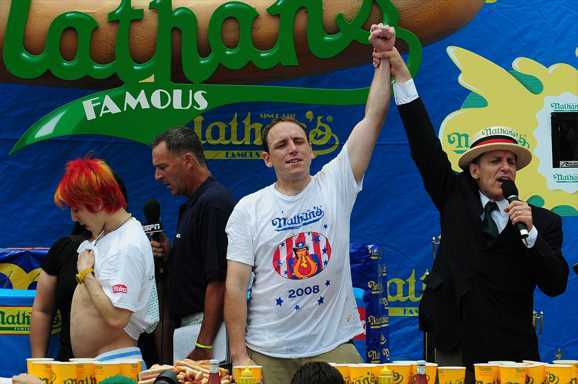 Now I’m a fan of Nathan’s hot dogs, and since they run probably the biggest eating contest around (it’s actually televised on ESPN, so take that those of you who still don’t think it’s a sport! ), I’ll pick on them for a moment. Watch the video below and tell me if it makes you want to run to your nearest Nathan’s for a good ol’ dog. Hmmmm. Not me. One is enough thank you — maybe two if I feel like gorging. But after watching that, not only do I not find Nathans as appetizing, but I may lose a pound or two this week shunning food altogether. My stomach’s almost churning just watching. Oh wow. As if the thought of an eating contest weren’t bad enough, I really can’t imagine doing that with jalapeños. Way to crazy for my blood. @ebru – I’m inclined to agree. Only in the US they will consider eating a sport. Here is a comment I posted on another page.